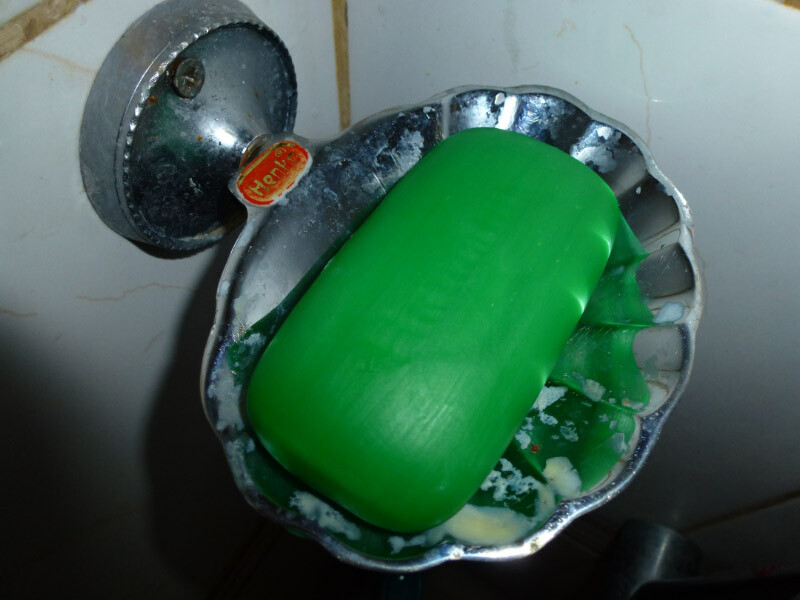 The first bar of soap I bought here turned out to be shamrock green, no, make that Wizard of Oz green. I didn't realize how green it really was tho until showering with it and watching the slightly dingy green water wash by my feet. It took a few moments to realize it was only the soap, for a moment there I thought I was in the Emerald City. When the little travel tube of US toothpaste ran out, I bought some kids' flavored Pepsident. It really shouldn't be that shocking, but I was taken aback by the color (not to mention the color of the spit that comes out of the boys after brushing). Guess I've just been programed for either white or blue toothpaste, nothing else. One other toothpaste factoid: they don't seem to have fluoride in any of it here, adult or children's. Update on Fluoride: It's in the toothpaste, just doesn't seem to be commonly listed on the box. But it's listed on the tube. 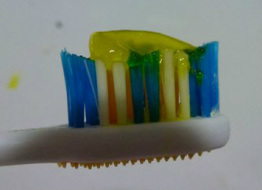 We finished the yellow toothpaste. The new toothpaste is bright green with white squares floating around in it. But this time I wasn't nearly as surprised by the first view of it. Kids say green tastes much better than yellow. And yet another color! This aruvedic toothpaste is called "Red" but that's not a very good descriptor. The flavor is eucalyptus mixed with mint. Tim won't use it (runs to the boys' bathroom to brush) so I've got a whole tube of it to get through. It does leave your mouth amazingly fresh though. . . as long as you can get past the burning sensation from all those herbs. 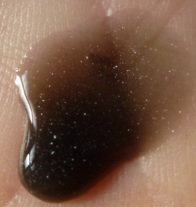 This was the first time I'd ever seen black (sparkly black!) shampoo. And, like the soap, it's more impressive in real life, and eye-opening the first time you open the bottle. House paint is also beautiful. In addition to pink and blue there are amazing shades of green, orange, and purple. Much more individuality than with the typical American home. Indian towels are really pretty. Mine's the red one. And again, really much redder than the camera shows. Like red that you'd expect to see under black light. We went out to breakfast right after the first time I used it . There's a great idly/dosa place very close to our place so you don't have to walk very far but you do have to cross Sampige Road which is one of the main arteries through Malleshawaram. Although we see lots of signs encouraging "lane discipline" it's not something that's really understood here. To cross you walk as close to one vehicle as you can, then zip behind it right up to the side of the next vehicle, then repeat 3-6 times until you've made it across all the lanes. It's an adrenaline-pumping exercise, especially since the motorcycles drive much faster than the cars and will sometimes appear from out of nowhere barreling straight at you in the narrow space you've found for yourself between oncoming cars. But we made it across safely and sat down at a table to eat. Kekai looked at me curiously: "Mom, your face is really red." I figured it was due to the excitement of the near-miss with a motorbike and pretty much ignored him. That night, washing my face, there was a surprising amount of red involved. I chalked it up to my long-sleeved red shirt thinking the color had rubbed off on my neck. Next bath I happened to look in the mirror after drying and before heading out -- bright red face. I mean BRIGHT red. Amazingly bright red. In fact, bright red arms too. Wow. Anyway, now after about 8 washes I can bathe without looking like a cartoon of someone who just ate chiles but I'm still drying my face on Tim's towel, just in case. 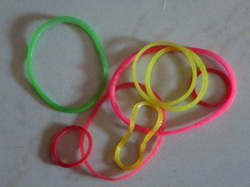 Even the rubber bands are more colorful here than in the US! The insects are just as colorful as the jewelery!